Since January 2012, we have a new collaborative research centre at RUB, the SFB/Transregio103. It is entitled "From atoms to turbine blades - a scientific approach for developing the next generation of single crystal super alloys". Our group has organized the preparation of the research proposal for our national funding agency DFG. The understanding of all of the materials science aspects of alloy development, in particu-lar the effect of microstructure inhomogeneities in the cast structure (on a microstructural scale) and the d-shell alloy elements (on the atomic scale) on thermodynamic equilibria, the kinetics of microstructural evolution and the kinetics of recovery processes in high temperature deformation. The consistent improvement and renewal of technological processes for the production of specific nanostructures and microstructures with improved homogeneity and optimized properties. 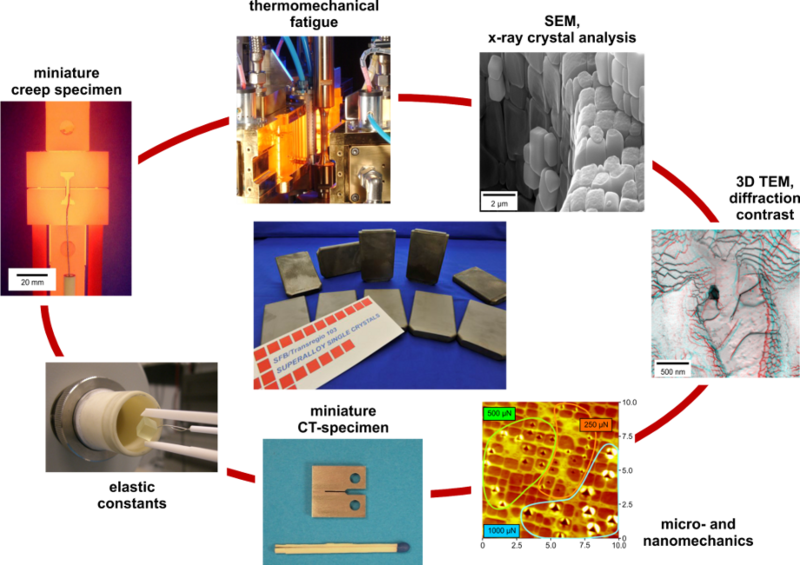 The provision of more precisely-tailored material characteristics by access to new me-chanical test methods (miniaturized creep and fatigue samples, nanometrology) and micro-structural methods of examination (high resolution, aberration-corrected transmission electron microscopy, tomographic atom probe). Multiscale modelling which comprehensively describes material behaviour on the atomistic (ab initio methods, molecular dynamics), through the mesoscopic (discrete dislocation modelling, thermodynamic and kinetic modelling of the microstructure) and the macroscopic level (physically justifiable constitutive equations). This will help to improve both processing and the understanding of high temperature deformation.